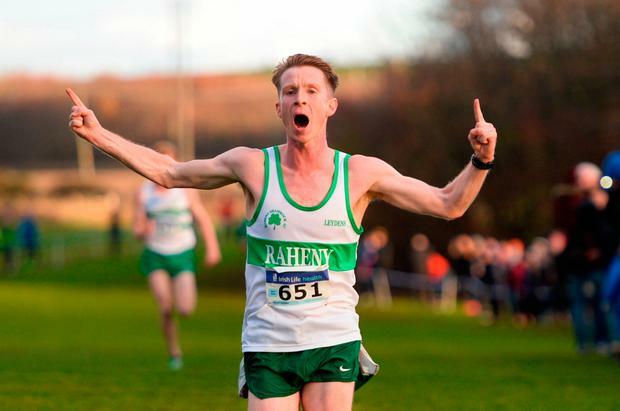 The best way to start is to see him at the finish, Kevin Dooney sprinting towards the line in the National Cross-Country Championships last Sunday. After 30 minutes of ferocious, fluctuating pain - the race itself a microcosm of his last four years - Dooney takes a long, searching look over his shoulder and realises that now, finally, he is safe. He lets rip a guttural roar, an eruption of raw, unfiltered euphoria. Frustration, anger, elation, joy - it's all there, exploding from him in a complex collage of the human condition. Over the past few years, Dooney has been trying not to tether his emotions to his performance - a dangerous game when things go awry - but this is one time he can't help indulge the endorphins. "It was a lot of joy and emotion," he says. "The best day I've had in athletics." It's midweek, three days on from his biggest sporting achievement, and if Dooney thought that high could be ridden much longer, well, the view out the coffee shop window of a damp, grey Dublin would soon cut him down to size. "I can handle running in s**t weather and I can handle darkness, but darkness and s**t weather? Nah," he says with a laugh. "It's learning things like that - things that will make the mind go to a bad place." He has taken the afternoon off from his nine-to-five in the Department of Communications, Climate Action and Environment, and while there are many things to discuss - next weekend's European Cross-Country, his four years at Yale University, his training under coach, Jerry Kiernan - what really piques the interest is not the battles Dooney has fought with his body, but those he's had to wage in his mind. It detailed his four-year duel with depression, one in which he had grown weary, his thoughts spiralling darker with each wretched wave that came his way. He can trace its roots back to October 2014, when Dooney was the stand-out distance runner at Yale, the prestigious Ivy League University in New Haven, Connecticut. His academics were going fine, so too his athletics, with Dooney on course for the NCAA Cross-Country Championships that November. But he felt an emptiness, an apathy about an opportunity most could only dream about. "You feel like, 'What right do I have to feel this way?' and that's a sure sign there's something wrong. If I was injured or running like s**t, then I'd feel I have a right, but on paper, this shouldn't be happening." He describes it like this: even on good days, his emotional health would only climb to a six out of 10, but gradually the overall scale shifted downwards. "The further I kept sinking into it, the high point could barely be called a high point anymore," he says. "Even on the best days, it's like: meh." That December, he confided to older brother, Conor, that something was amiss, but it was another year before he sought professional help, Dooney booking in with a therapist while on his winter break back in Dublin. Back at Yale for his final semester in 2016, he would Skype her once a week, but progress was slow, often painstaking. "Even when I'd talk to her for one hour a week, you're still wearing a mask the rest of the time. The other six days, it's a facade. There's an exhausting nature to that." He never stopped running, even through the darkest times. "It's been my one cornerstone. Since I was 16, I was always the runner, and if you pack in the running, would you be happier? That was such a big if that I never considered it." Running may be an effective tool to combat depression, but the jury is out when it comes to those operating in the sport's upper reaches. A study in 2016 found track and field athletes have the highest rate of depression among US collegiate sports, with 37 per cent of women and 25 per cent of men reporting depressive symptoms. But Dooney is adamant that it has helped, not hindered, his recovery. "I know I can be happy while running, so I want to work out the rest of my life around it. These days, if I want to take a day off because I don't feel like running, then I do." The decision to talk about his depression was spawned by two incidents. The first was the suicide of his former Yale team-mate, Hale Ross, and a poignant piece written by Ross's father earlier this year in the 'Yale Daily News'. The second was the suicide of Scott Hutchison, the lead singer in Frightened Rabbit. "I was sitting there feeling really s**t about myself and reading that piece from Hale's dad and about Scott Hutchinson, I realised there are steps down that path and if I'm not careful, the mind can go to those places." When he talked, it's not that his problems suddenly dissipated, just that the overall trend, that emotional scale, has slowly begun to shift upward. At next weekend's European Cross-Country, his goal is to crack the top 20 in the senior men's race, and as he looks to 2019, he does so with optimism. Dooney will make his marathon debut in the autumn, then give it all he has to make the Tokyo Olympics in 2020 - body and mind, hopefully, working in unison. "I'm definitely in a better place," he says. "It was a little daunting to open up, but in the aftermath I'm very glad I did - to have that honesty, most of all with myself."